Florida Georgia Line's "FGL House" Set to Open June 5th! Florida Georgia Line's new downtown venue at 120 3rd Ave S. will hold its grand opening on June 5th! 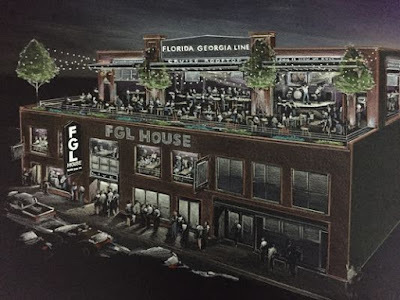 FGL House will open it doors at 7 PM, just in time to kick start CMA Fest week! VIP memberships that allow members and and a guest to bypass the entry lines and cover charges are available. FGL Lifers (fan club members) receive a 20% discount on the FGL House VIP membership fee which is $100 per year or $250 for a lifetime pass. Brian Kelley and Tyler Hubbard will be on hand to meet and greet fan club members on June 10th prior to their performance at Nissan Stadium! FGL Lifers may enter for a chance to win a meet and greet on the FGL Lifers Meet and Greet Signup Page. See the full FGL House Press Release here. Sign up to become an FGL Lifer here. Purchase a FGL House VIP Membership here. Register for June 10th Meet and Greet here (FGL Lifers only).